The Videocon Infinium Z45Q Star was launched in 2015. The highlighting factor of this phone is the availability of 1GB RAM enabling the processor to perform much faster. The Videocon Infinium Z45Q Star price is budget-friendly at INR. 4226. The key feature of the Videocon Infinium Z45Q Star includes a Quad-core processor of 1.3GHz frequency. The storage capacity of the phone is 8GB that can be extended up to 32GB on a microSD card. The main camera of the phone is helpful to click beautiful pictures at 5 Megapixel while the secondary camera is equally good at 2 Megapixel. The battery of the phone performs well at 1600mAh capacity. 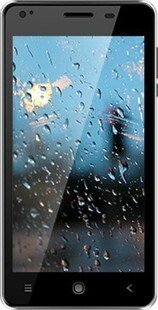 The display screen of the Videocon Infinium Z45Q Star is of 4.5-inch with proper resolution and picture quality. The body is amazingly sleek and easy to hold for a long time. It is available in Grey and Silver colors. The reason to buy the Videocon Infinium Z45Q Star is the RAM, processor, camera and overall design. Videocon Infinium Z45Q Star full specs and reviews as of Apr 2019. Buy it here!